Make your own Terrarium at Shannon Brewing Co! Make your own Terrarium and enjoy some fresh brews from Shannon Brewing Company in Keller, TX! 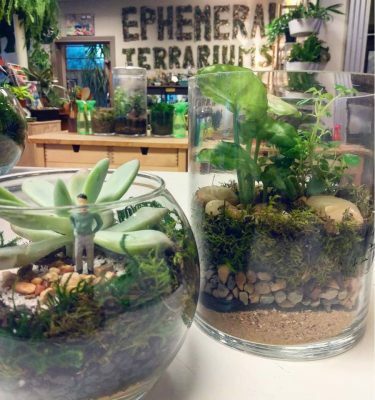 Ephemera Terrariums will walk you step by step through how to make and care for your very own Terrarium! Once that’s done, you’ll visit our Decoration Station where you can use our wide variety of gravels, mosses, woodsy bits and tiny toys to bring your mini world to life! Class is $30 and includes plant, all supplies and instruction to build our classic bubble bowl Terrarium as well as two pints from the Shannon Brewing Co! Or make it deluxe and build our stylish cylinder Terrarium and enjoy two pints for $40. Classes will be held at 3pm and 4pm. Tickets is required and space is limited. This event is 21 and up. Link below to purchase tickets!